Our first visit of the day began at Devon House of Allentown. Our veterans had some time outside of the retirement home while the staff brought their veterans to the community room. Detachment Judge Advocate Howard Schaeffer brought along Opha Mae, his service dog, and of course she was a hit with all. When all where gathered in the community room, all vets had name tags on and we were ready to roll. Our first duty was to face the American Flag and come to attention and salute while reciting the Pledge of Allegiance. 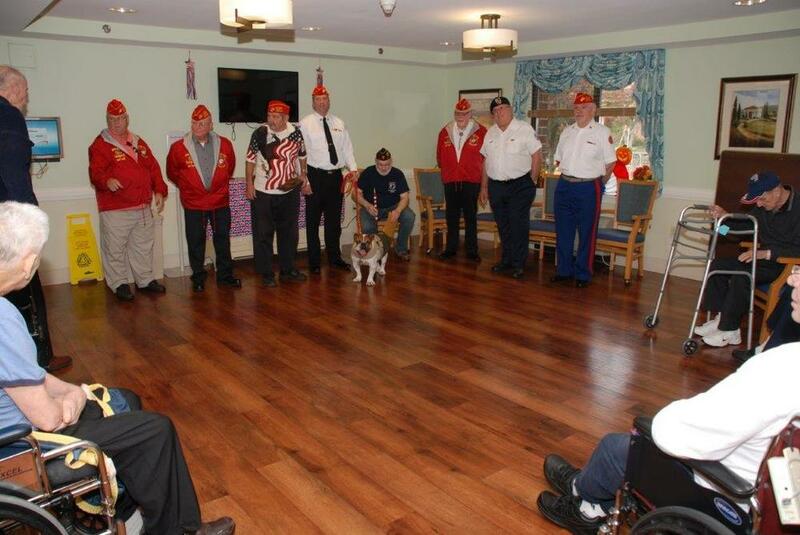 Hank Brokate then presented a flag to all vets while being assisted by all veterans from our group. After presenting the flags we spoke to each veteran about their service time and came away with very interesting stories of their time in the military service. The experience was beneficial to both sides. We then sang each service branch song and closed with God Bless America, with all participating. While this ceremony was taking place there was an audience of women who were watching from outside the room and cheering on the event. Our next stop was at Luther Crest Retirement Community, after getting our group together we met with veterans in their community room. A similar ceremony took place but without the passing out of flags. The American Legion had a shortage of flags and will deliver flags in the future if approved.